Some things just belong together. Music at a cookout is definitely a classic combination. But music in a gas grill? 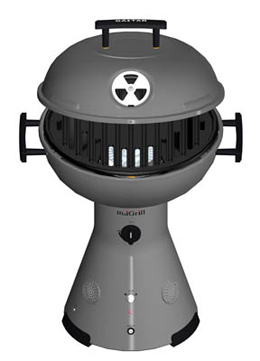 I’m not exactly sure why, but somebody thought it would be a good idea to combine a propane powered gas grill housed inside a base which includes two “powerful” speakers. If you don’t mind a little grease with your iPod or other mp3 player, you can now pick up the Gastar miGrill Tabletop Gas Grill with Built-In Speakers. Highly portable, measuring two feet high, with a width of 17.5 inches, the grill has 160 sq. inches of cooking surface. The speakers are powered by 4 AA batteries or an included adapter, while the included drip pan and cooking surface are both dishwasher safe. Sounds like the perfect complement to the Hampton Grease Band.